Let’s start by noting that this is not a drink that we expect many people to make at home. The Corn ‘n Oil is a very good cocktail, but perhaps a bit random “esoteric” for some. But since this week’s bonus cocktail was a Manhattan variant, we figured we could try something a bit different for our weekly post. And the Corn ‘n Oil certainly is “different”. Blackstrap rum and velvet falernum are not common ingredients, but are useful in plenty of cocktails. The Corn ‘n Oil combines blackstrap rum, velvet falernum, lime juice and Angostura bitters and is served on the rocks. And if you are unfamiliar with blackstrap rum and velvet falernum, you are not alone. To be honest, we only have them on hand because both are common accents in tiki drinks, and we do like our tiki drinks. Blackstrap rum is basically very dark rum. 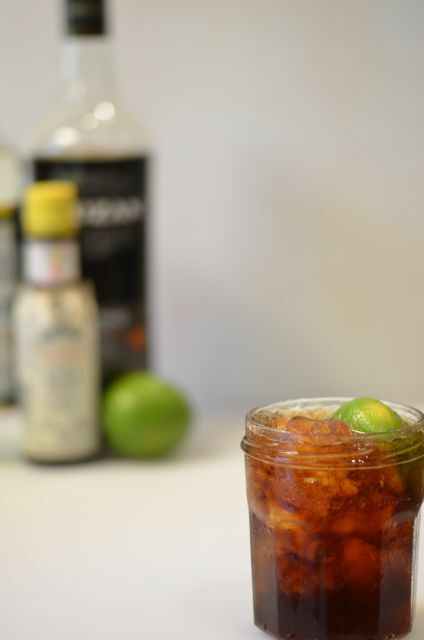 Cruzan is the blackstrap rum in tiki circles and in the Corn ‘n Oil. It has overt molasses and spice flavors with some clear bitter notes. On first sip, it seems unappealing, but somehow it grows on you. Many tiki drink aficionados use the Cruzan as the “float” instead of more common dark rums like Meyers. Cruzan Blackstrap rum is cheap ($15) and good stuff- so worth a try if you find it. As for velvet falernum, it is a sweet, spicy, lightly-alcoholic liqueur with lime notes. There are also non-alcoholic falernum syrups, Fee Brothers makes a version that’s widely available. You can also make your own. Falernum, along with Orgeat, is a popular sweetener in many tiki drinks. The only velvet falernum widely sold in the US is John D. Taylor’s from Barbados, the original home of falernum. It is inexpensive (under $20) and will last a long time, but it may be hard to find. 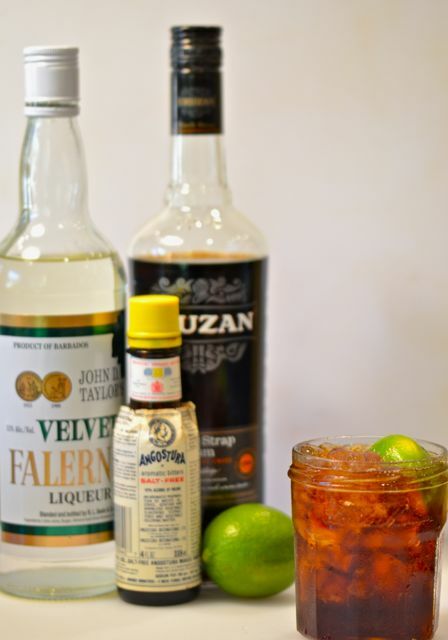 In this recipe we suggest you use velvet falernum, but falernum syrup will work in a pinch. As for making the actual drink, like many cocktails, the recipes vary. Not surprisingly, the recipe on the back of the John D. Taylor Velvet Falernum bottle suggests a ratio of 3-1 falernum to rum. This is OK, but most current recipes suggest anywhere from a 50/50 split to 3-1 rum to falernum, particularly if using the Cruzan Blackstrap rum. 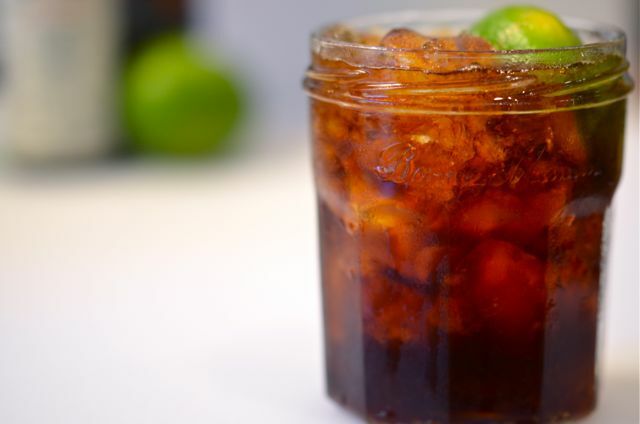 Most recipes do agree that you need 1/4 to 1/3 of an ounce of fresh lime juice and some even suggest a splash of coke. We use a recipe from the cocktail book “Bitters” by Brad Parsons. We like the book and this recipe, but feel free to play around. We like just a bit more lime juice. Yes, it does look like old motor oil…but it tastes better. As for the flavor of the Corn ‘n Oil, it tastes like a much more flavorful version of a rum and coke. And this is a good thing. (C’mon, secretly most of us like a rum and coke every once in a while 😉 ) The blackstrap rum adds spice, bitterness and depth. The falernum adds clove and sweet lime notes that compliment the acidity of the fresh lime juice. The bitters add even more spice. Overall, there is a lot of good flavor in this drink. But there is one big caveat, the first sip is tough. The overt molasses flavor and bitterness from the blackstrap rum can be overwhelming. But then, suddenly with the next sip, it gets better. And as the ice melts into the drink, it gets good. Real good. As we noted earlier, we don’t expect that many people will have the ingredients to make this drink at home, but the next time you see this drink in a good bar, give it a try. If you get past the first sip and the odd name, you are in for a pleasant surprise. 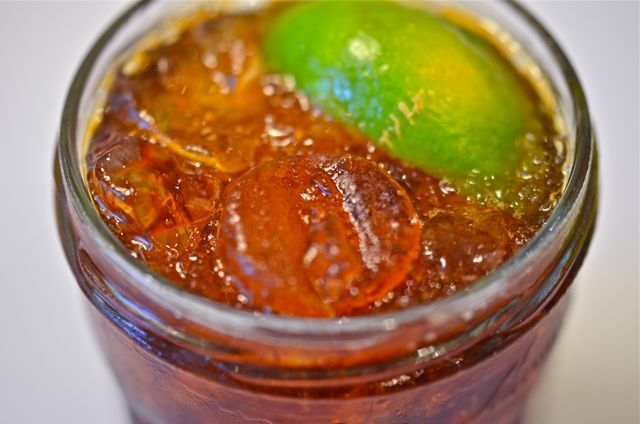 Fill a lowball or old-fashioned glass with crushed ice. Add the rest of the ingredients and stir until well chilled. Add the lime garnish and serve. Yes! I love blackstrap rum (or any rum, for that matter). I will definitely try this! Cool- it is a drink that grows on you..we will make this pretty often…and it is a better summer drink than you light expect. I like that…rum is fuel! Have been drunk on it twice … and cant stand even the smell today. I think we all (unfortunately) have one of those…It took me years to get back into Gin after a bad night many moons ago.. I think I stick with Absolut … you have to serve some of there good drinks too. Thanks- it is realt different and worth a try! I have the black strap rum… but not the velvet falernum. Must find it! This looks wonderful. Cool- you can use the falernum syrup, if easier to find..it is still plenty good. Just ordered a bottle of Velvet Falernum. WOO HOO! Cool- glad you tried it (and liked it). I am with you that more falernum is too sweet…. Damn you, you’ve done it again! You see, this is why we read your blog. I don’t have any familarity with either of these main ingredients and yet I feel as though I just polished off one of these delectable cocktails. So, what good thing happened to you after a couple of these bad boys were consumed?